Success! The Board and Friends of Garrison School Cultural Center wish to thank everyone in the community who supported our special Juneteenth fundraising celebration Friday evening, June 24, 2016. 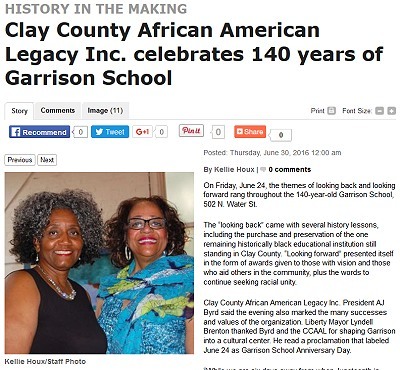 Members of the Clay County African American Legacy Inc. will host its 16th annual Juneteenth Celebration and the upcoming 140th Anniversary of Garrison School located at 502 N. Water Street at 6:00 p.m. on June 24th. Garrison, established in 1877, is the one remaining historically black educational institution still standing in Clay County. Tickets for the event are $50.00 and will include a Soul Food Dinner, Silent Auction, and musical entertainment featuring “Mark Anderson and Christian Friends” of Greater Kansas City. Success! The Board and Friends of Garrison School Cultural Center wish to thank everyone in the community who supported our special Juneteenth fundraising celebration Friday evening, June 24, 2016. More details.